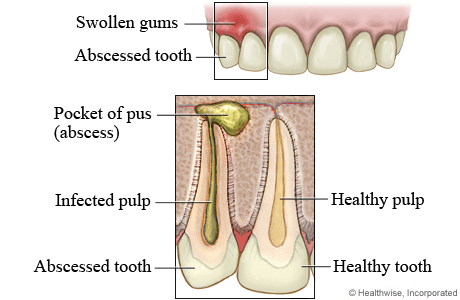 An abscess is a collection of pus that is located around the root of a tooth, between the root and the gums or inside the bones of the jaws. This is a serious condition that requires medical attention. 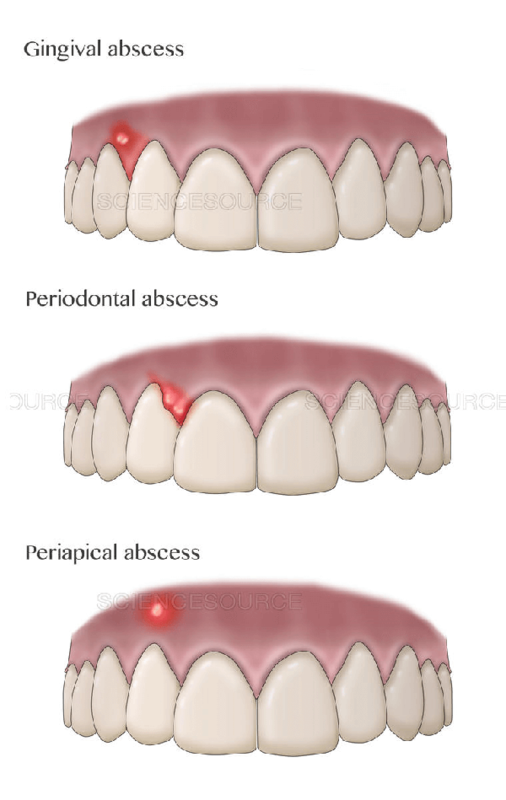 The abscess that is located on the tip of a root is called periapical abscess, while the one that is located in the gums is called periodontal abscess. The abscess is caused by a bacterial infection and it causes pain. The most common reason for an abscess is dental caries, and other reasons include periodontal disease, dental trauma and more. The main symptom of dental abscess is pain. The pain is usually very sharp and more intense when you bite on the tooth, the tooth is very sensitive, there might be a slight fever, unpleasant breath. The pain intensifies when the patient lies down, and it might spread to the ear, neck, and jaws. The pain can be located on the area where the tooth is, but sometimes patients complain of an intense pain that radiates towards the head, ear, temporal bone, neck and more depending on the location of the tooth. The whole area is swollen and there is usually redness in the affected mucosa surrounding the tooth. Patients are sensitive to cold and hot drinks and foods. They usually can’t put their upper and lower teeth together, because that is when they experience severe pain. They can have a higher body temperature and swollen lymph nodes. Most patients have a weird taste in their mouth. When it pain starts it is milder, but it becomes more intense in the following period. Patients have a difficulty in eating, swallowing and chewing. Insomnia is another symptom, due to the intense pain. Every abscess should be treated because the infection might spread and cause greater problems. The main goal of the treatment is to drain the abscess by making an incision or performing a root canal treatment. If the root canal treatment is not successful, the tooth has to be extracted. Once the dentist has performed an incision or has perforated the crown and the abscess is drained, the pain goes away. Every dentist will try to perform a root canal to save the tooth first. If it is properly done, the chances of success are high. There are three types of an abscess. The first one is periapical and it’s the most common one. It is located on the tip of the root and the causes include dental caries and all of the other factors that affect the health of the dental pulp. Once the pulp is infected, and not treated with a root canal procedure, the infection spreads into the periapical tissues. That is how an abscess occurs. The second type is periodontal, and the location is in the periodontium. It happens as a result of periodontal disease. It is also characterized by the collection of pus and pain. A gingival abscess is the third type, that is only located in the gum tissue. The most common location is right next to the neck of the tooth.